Are writing scores always the lowest test scores in your school? Would you like to know how to improve student writing before the 2014/2015 Common Core tests? If you answered yes to either of these questions, then this free, 45 minute webinar is for you! You will be presented with practical solutions you can use right away with your staff to prepare for the Common Core writing transition in your school. Solutions for Common Core Success was featured on Education Leaders Network and is full of useful tips to support your teachers’ focus on strong Common Core writing instruction. You will also learn about different writing obstacles your teachers face and how you can help remove these roadblocks in order to foster a great writing culture within your school! 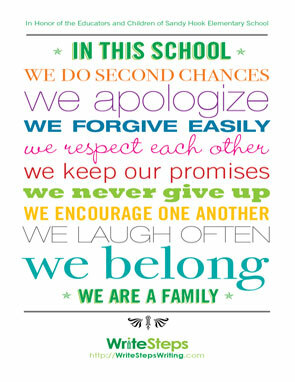 We are giving away these inspirational “We Are a Family” posters to schools around the nation to show support for Sandy Hook Elementary School and honor the lives lost on December 14, 2012. Download the posters for free by clicking here. The posters are designed to be printed in 11×17 and can be sent to your local printer to print in poster size, or they can be printed in standard 8 ½ x11 format. Once the posters are displayed in your school, please take a picture of yourself with colleagues in front of the posters and share them on our Facebook page to help spread this act of kindness. 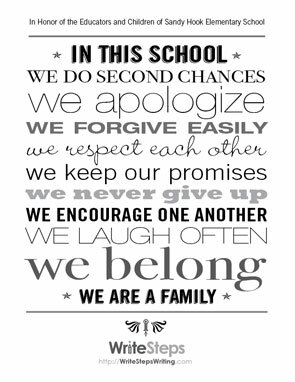 We want share the posters with teachers and educators around the nation to spread the message that together, as an education community, we are working to create a better world for our children. A Writing Contest for Students! Do you want to inspire your students to write at their best levels? If so, WriteSteps is launching an opinion writing contest for 3rd, 4th, and 5th grade students. If you are a teacher currently using WriteSteps, this is an opportunity to give your students a chance to have their writing published and shared with children around the nation! Student winners will also receive a year-long subscription to a grade appropriate magazine of their choice! 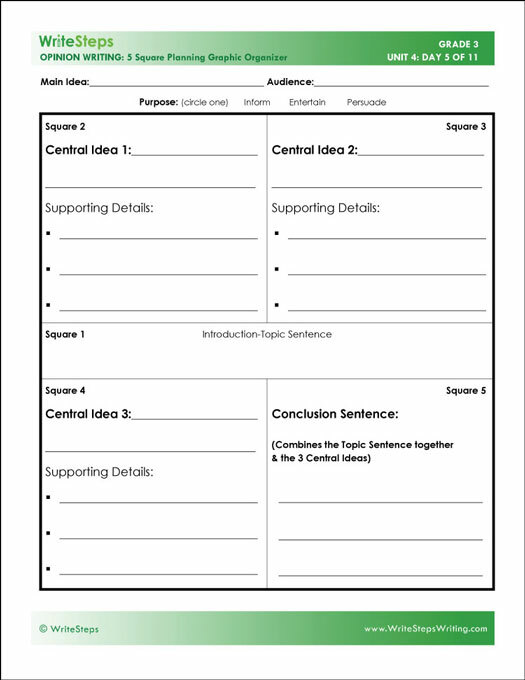 Assign your students a writing prompt described in the “Extensions for Writing across the Curriculum” lesson found on the last day of Unit 4. Submit two to three student 5 Square Paragraph Opinion (taught in Unit 4) writing pieces and planning sheets to [email protected], by April 30, 2013. Entries will be scored using the 6 Traits Rubrics for the appropriate grade level. Students from each grade level (3-5) with the highest score will win. The winning student opinion pieces will be published as student samples in Unit 4 of eWriteSteps and they will be recognized on the WriteSteps website. Winners will be notified by May 31, 2013. This is a great opportunity to showcase your students’ writing accomplishments! Nominate WriteSteps for the District Administrations Readers’ Choice Award! If you’re a current teacher or principal using WriteSteps, we are seeking nominations for the District Administration Readers’ Choice Award! Click this link to fill out a brief form and explain how WriteSteps has made a positive difference in your school district this past year. Thanking you in advance for your nominations! 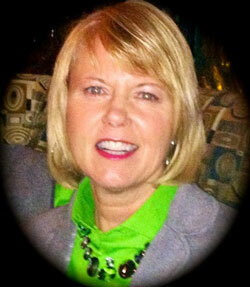 The WriteSteps team extends a warm welcome to our newest team member, Kim Gates! As our national presenter, Kim will be traveling around the country presenting at conferences and creating awareness of our writing and grammar program. When Kim is not presenting at conferences with WriteSteps, she is helping students improve their writing through brainstorming, content organization, revising, or editing, at Davenport University. Writing is her focus all day, every day! If you are near Grand Rapids, Osage Beach, or San Diego in the coming months, stop by the WriteSteps exhibit at one of these conferences to get all of your Common Core writing questions answered! While there, you can sign up for a free trial to eWriteSteps, which automatically enters you into a drawing to win a new iPad! Denise Dusseau, WriteSteps Curriculum Creator, will present “7 Keys for Common Core Success” at the Michigan Reading Association’s Annual Conference. After you watch Denise’s presentation, stop by the WriteSteps exhibit and meet Terry Gates, our national awareness director, to learn more about our writing and grammar program. Don’t miss your chance to learn what you need to know about the Common Core with WriteSteps National Presenter, Kim Gates, at the Missouri Association of Elementary School Principals Spring Conference. Meet Awareness Ambassador Ben Kutzs, who will be exhibiting at the WriteSteps booth during the conference. You’ll be glad you did! Check out “7 Keys to Common Core Success”, presented by WriteSteps Curriculum Creator, Denise Dusseau, at the 20th Annual California Charter School Association’s Conference in San Diego, CA. Denise, a veteran teacher and adjunct professor, can answer any Common Core writing questions you have!